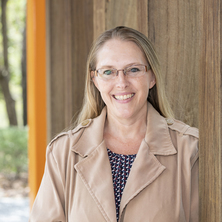 Jenny Povey is a Senior Research Fellow in Social Methods at the Institute for Social Science Research and a Life Course Centre Fellow in the ARC Centre of Excellence for Children and Families over the Life Course at The University of Queensland. She is a Psychologist and obtained her BA Honors, MA and PhD from the Nelson Mandela Metropolitan University in South Africa. Before coming to ISSR, Jenny worked as a Chief Researcher at the Human Sciences Research Centre in South Africa in the area of Education effectiveness. Jenny’s expertise is in survey development, evaluative research, social science survey data collection, quantitative and qualitative research methods, statistical analysis of complex data. Jenny's research interests include intergenerational transfer of education aspirations, values and attitudes, parent engagement practices in student learning, principal leadership for parent-school-community engagement, education effectiveness, evidence-informed school practices, culture-fair assessment, cross cultural research, well-being, social disadvantage, and evidence based policy. Jenny has worked closely with Government Departments and Ministries both in Australia (DHHS in Tasmania; Commonwealth DET; Qld DET; CESE) and internationally (e.g. South Africa, Eritrea, Cambodia and the Solomon Islands) to gather research evidence from a wide range of disadvantaged communities to inform policy. Jenny teaches the MFSAS Qualitative Research Methods course and the ‘Quantitative and qualitative data in policy formulation’ module in the ‘Strengthening the Public Policy Making Process Short Term Award’ managed by the UQ International Office. Willis, Linda-Dianne, Povey, Jenny, Hodges, Julie, Carroll, Annemarie and Antrobus, Emma (2018). Engage to learn: working in partnership with families. In: Transforming Service Delivery. Queensland Department of Education Research Showcase, Brisbane, Australia, (). 27 November 2018. Willis, Linda-Dianne, Povey, Jenny, Hodges, Julie, Dolley, Christine, Carleton, Phillip, Wilkinson, Louise and McAllister, Danielle (2018). Parent engagement research and evidence. In: Parents as partners in learning. Parents and Citizens Association of Queensland State Conference, Brisbane, Australia, (). 7-8 September 2018. Queensland school business managers’ wellbeing survey. Final report. Prepared for School Business Managers’ Association Queensland. University of Queensland, Institute for Social Science Research. Group concept testing of 5 translated Gestational Diabetes brochures for Diabetes Queensland. Final Report. Parents’ interest in their child’s education and children’s outcomes in adolescence and adulthood: does gender matter? Parent engagement: The current research. How can schools engage with parents in ways that will benefit student learning? Povey, Jenny and Willis, Linda (2016) Parent engagement: The current research. How can schools engage with parents in ways that will benefit student learning?. CIRCLE - The Centre for Innovation, Research, Creativity and Leadership in Education, . Povey, Jenny and Willis, Linda (2016) Parent engagement: the current research. CSM premier, 33 10: 1-1. The development of a new multi-faceted model of social wellbeing: does income level make a difference? Cherney, Adrian and Povey, Jenny (2013) Exploring support for terrorism among Muslims. Perspectives on Terrorism, 7 3: 5-16. Willis, Linda-Dianne, Povey, Jenny and Hodges, Julie (2018). Principal leadership for “Parent engagement in schools” (PES): Effective strategies and practices. In: Australian Association for Research in Education (AARE) Conference, Education Research Matters: Impact and Engagement, Sydney, Australia, (). 2-6 December 2018. Willis, Linda-Dianne, Povey, Jenny, Hodges, Julie, Carroll, Annemarie and Pedde, Charley (2018). Principal leadership qualities and strategies: engaging parents and the community in disadvantaged schools. In: British Educational Research Association (BERA) Conference, Newcastle, United Kingdom, (). 11-13 September 2018. Willis, Linda-Dianne, Povey, Jenny, Hodges, Julie, Campbell, Alice and Carroll, Annemaree (2017). Innovative parent engagement leadership practices across diverse school contexts. In: Parent Engagement Conference Australia with The Smith Family, Maximising every child’s potential, Melbourne, VIC, Australia, (). 6-8 June 2017. Povey, J. and Willis, L. (2017). Innovative parent engagement leadership practices across diverse school contexts. In: ARACY Parent Engagement Conference, Melbourne, VIC, Australia, (). 6-8 June 2017. Showing interest in their adolescents' education: can dads make a difference? Povey, J. and Campbell, A. (2017). Showing interest in their adolescents' education: can dads make a difference?. In: ARACY Parent Engagement Conference, Melbourne, VIC, Australia, (). 6-8 June 2017. What knowledge and strategies do principals, who appear to facilitate effective parent-school-community engagement, use? Willis, Linda-Dianne, Povey, Jenny, Hodges, Julie, Carroll, Annemarie and Antrobus, Emma (2017). What knowledge and strategies do principals, who appear to facilitate effective parent-school-community engagement, use?. In: Research Showcase 2017: Make an Impact!. Queensland Department of Education Research Showcase, 30 Mary Street Brisbane, (). 14 November 2017. Povey, Jenny, Campbell, Alice, Hancock, Kirsten and Mitrou, Francis (2016). Academic socialisation and the intergenerational transmission of education advantage. In: SSLS 2016: Society for Longitudinal and Life Course Studies International Conference, Bamberg, Germany, (). 6-8 October, 2016. Cuskelly, M., Povey, J. and Jobling, A. (2016). Receptive vocabulary development in individuals with Down syndrome. In: Journal of Intellectual Disability Research. 2016 IASSIDD World Congress, Melbourne VIC Australia, (654-654). 14-19 August 2016. Hancock, Kirsten, Mitrou, Francis, Povey, Jenny, Campbell, Alice and Zubrick, Stephen R. (2016). Three-generation education patterns among grandparents, parents and grandchildren: Evidence of grandparent effects from Australia. In: SSLS 2016: Society for Longitudinal and Life Course Studies International Conference, Bamberg, Germany, (). 6-8 October, 2016. What can the frequency of contact between grandparents and grandchildren tell us about 'direct' effects of grandparent education on the academic outcomes of grandchildren? Hancock, Kirsten, Povey, Jenny, Mitrou, Francis, Campbell, Alice and Zubrick, Stephen R. (2016). What can the frequency of contact between grandparents and grandchildren tell us about 'direct' effects of grandparent education on the academic outcomes of grandchildren?. In: SSLS 2016: Society for Longitudinal and Life Course Studies International Conference, Bamberg, Germany, (). 6-8 October, 2016. Why do some disadvantaged Queensland schools appear to be better at parent engagement than others? Willis, Linda-Dianne, Povey, Jenny, Hodges, Julie and Carroll, Annemarie (2016). Why do some disadvantaged Queensland schools appear to be better at parent engagement than others?. In: Department of Education Australian Research Council Showcase Symposium: Research Partnerships Making a Difference, 30 Mary Street Brisbane, (). 21 November 2016. Povey, J. (2014). Exploring positive parental and community engagement with Queensland state schools. In: Be the change: P&Cs Qld 2014 State Conference, Gold Coast, Australia, (). 12-13 September 2014. Povey, J. (2014). School Business Managers’ Association Queensland Wellbeing Survey presentation of results. In: The School Business Managers’ Association Queensland Conference, Gold Coast, Australia, (). 13-15 August 2014. The functionality of Leximancer software as an analytic tool for semi-structured interviews data exploring evidence-based policy in practice from the perspectives of academic social scientists and policymakers. Povey, Jenny, Shaw, Elizabeth, Head, Brian, Cherney, Adrian, Boreham, Paul and Ferguson, Michele (2013). The functionality of Leximancer software as an analytic tool for semi-structured interviews data exploring evidence-based policy in practice from the perspectives of academic social scientists and policymakers.. In: AMSRS Conference, Sydney, Australia, (). 5-6 September 2013. Tomaszewski, Wojtek, Boreham, Paul, Jones, Andrew and Povey, Jenny-Louise (2012). Living environment and wellbeing: the effects of housing and local area disadvantage. In: 12th Australian Institute of Family Studies Conference, Melbourne, Australia, (). 25-27 July 2012. Povey, J., Boreham, P. and Tomaszewski, W. (2011). Factors Influencing Social Wellbeing, deprivation and Social Exclusion. In: TASA Conference 2011, Newcastle, Australia, (). 29 November - 1 December 2011. Boreham, P. and Povey, J. (2010). Assessing Gender Inequalities in the Academic Workforce. In: Australian Higher Education Summit, Adelaide, (). 2010. Boreham, Paul R. and Povey, Jenny (2010). Measuring social wellbeing in Queensland. In: Social Wellbeing in Queensland Conference 2010, Brisbane, QLD, Australia, (). 15 June 2010. The review of UQ scholarships: The perspectives of staff and scholarship recipients. Final Report. Prepared for The University of Queensland, Academic Services Division. Parents’ interest in their child’s education and children’s educational outcomes across the life course: does gender matter? Povey, Jenny, Campbell, Alice, Hancock, Kirsten, Mitrou, Francis and Haynes, Michele (2016). Parents’ interest in their child’s education and children’s educational outcomes across the life course: does gender matter?. LCC Working Paper Series 2016-22, Institute for Social Science Research, The University of Queensland. Hancock, Kirsten, Mitrou, Francis, Povey, Jenny, Campbell, Alice and Zubrick, Stephen R. (2016). Three-generation education patterns among grandparents, parents and grandchildren: evidence of grandparent effects from Australia. LCC Working Paper Series 2016-08, Institute for Social Science Research, The University of Queensland. Public Sector Survey on Evidence Based Policy: Results For The Department Of Employment, Economic Development And Innovation. Institute of Social Science Research, University of Queensland. ARC Industry Partner Linkage report and fact sheet. Note for students: Dr Jenny Povey is not currently available to take on new students.